I would like to thank all of you for your sweet comments and prayers for my father in law who was in a motorcycle accident. He was able to get up and walk a little for the first time in almost two weeks. He is still in the hospital, but we are hoping that will change soon. Once again, your prayers are very much appreciated and I thank you for your concern. This Snickerdoodle flavored cupcake is topped with fluffy butter cream frosting sprinkled with cinnamon. It is displayed on a decorative white cake plate and covered with a glass cloche. A tiny blue and whited checked bow is glued below the knob on the cloche. The banner at the top announces the flavor of this delightful dessert and is accented with green ivy. I love this new print as well! Great news for your FIL, hope he's feeling better soon. 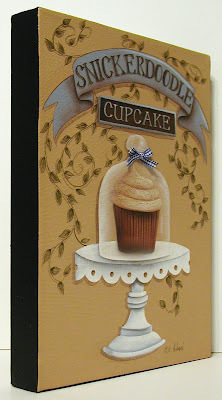 Wonderful cupcake, that cake stand is so perfect. I like the crisp white color. so pretty! i am just amazed everytime i see your art :) even a simple little cupcake can look so ... decadent and elegant with your touch! the shadows that you cast on the cake, the tray, the little holes on the tray, THE BANNER and WRITING, THE LEAVES!!! all just perfect! It is fine to hear that your father in law is recovering. 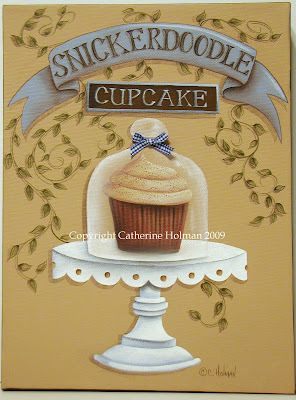 Not neccesairy to say that I love your cupcake- painting, cause I love them all. We do have alot incommon... I taught painting for 27 years and I married my next door neighbor at age 19. We just celebrated our 35 anniversary. I am a CDA and was very involved for many years going to conventions and painting like crazy. I haven't painted in a few years but I really have to get back to it... You do wonderful work and I love your blog!! !